What comes to mind when you think of hate? During our family discussion, my wife and I were trying to teach our sons the difference between love and hate. Ultimately, we ended our discussion with the thought that hate is limited thinking. However, I would like to include you in our discussion. How do you feel about hate? Hate is an intense or passionate dislike for someone or something. One form of hate we are all familiar with is racism, but there is a greater form of hate. I believe the greatest form of hate is xenophobia. Xenophobia is hate of anything foreign or strange. Xenophobia is the greatest form of hate because it includes bullying, racism, socioeconomic hate, religious hate, political hate, sexual orientation hate, etc. Regardless of the form of hate, the common denominator with most acts of hate is fear. 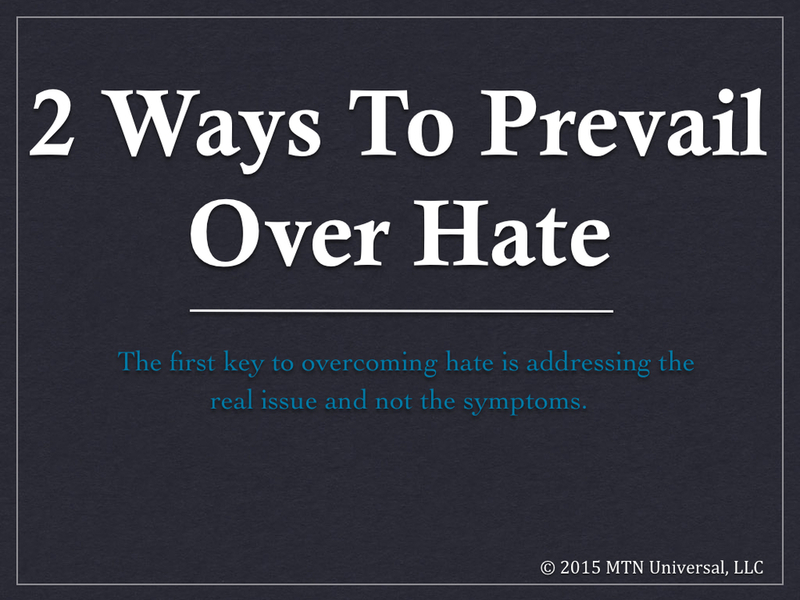 The first key to overcoming hate is addressing the real issue and not the symptoms. The real issue when it comes to hate is fear. Here are two ways to prevail over hate. 1. Practice forgiveness. Many people find it very hard to forgive, which leads to further fear and hate. However, if we can find a way to let go and release those things that have negatively impacted our lives, we find ourselves prevailing over hate. Hate can be directed towards yourself or others. Sometimes you have to forgive yourself. No matter whether it is yourself or someone else, hate is a heavy load to carry. This is why it is so important to forgive and let go. 2. Give love. Love is much stronger than hate. We have seen and heard stories concerning actions driven by love. Love will always overcome hate. We have seen various types of actions driven by love such as love for God, love for country, love for children, love for spouse, love for life, love for sports, love animals, love for music, etc. We have seen some amazing moments and actions driven by love. There are two great quotes from the Bible relating to love. Instead of releasing any kind of hate into our world, let love prevail. Question: How can you help this world prevail over hate? Leave your comments below.